Coach Bob Bradley says the 1-0 victory over Algeria was a "magic moment"
Johannesburg, South Africa (CNN) -- American striker Landon Donovan told CNN's "American Morning" that the U.S. can "beat anyone" after his injury-time goal helped the side qualify from the group stages of the 2010 World Cup on Wednesday. 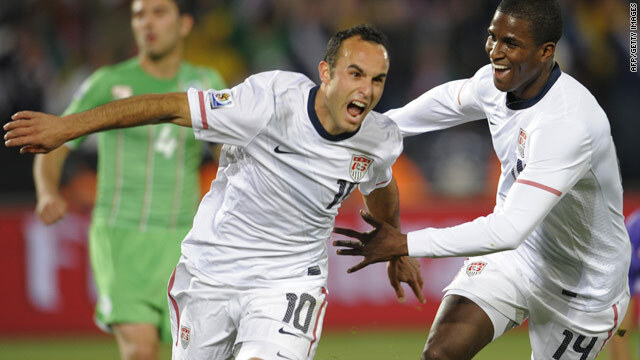 Donovan, who plays for Major League Soccer side the Los Angeles Galaxy, struck with only seconds left of the game to seal a 1-0 win over Algeria and put the U.S. top of Group C above fellow last-16 qualifiers England. The Americans will now face Ghana, who finished second in Group D, on Saturday in Rustenburg in a last-16 knockout game. "We believe we can beat any team in this tournament. Given our experiences from last year [at the Confederations Cup] we think we can do really big things, we're going to go for it," the 28-year-old told CNN. "We had some good moments but I didn't have a lot of opportunities, so when I did get a chance I wanted to make the most of it." Prior to the tournament, football's world governing body FIFA reported that Americans had bought more tickets than any other nation. 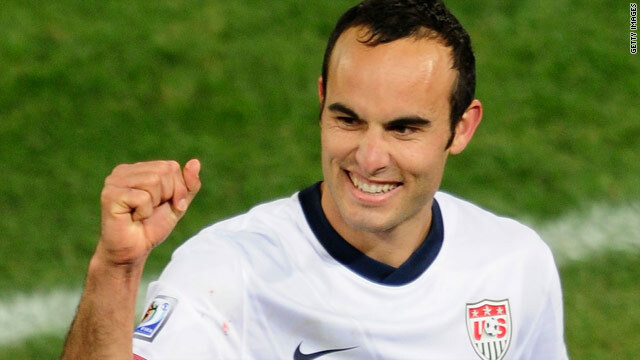 And Donovan paid tribute to the U.S. fans who had traveled to South Africa to support the team. "[They were] unbelievable, before the game, during the game -- so many people are here, if they've booked their tickets home they better extend their stay!" he said. Donovan was also glad that, despite another goal being ruled out by the referee, all three points were taken from the game. "There were a lot of nerves and frustration because we felt we had done enough to get at least one goal, we had a goal that was disallowed -- [so there was] a lot of relief at the end. They had some good chances, they hit the crossbar, but we hopefully we'll score some more goals in our next game." Coach Bob Bradley said the result was a "magic moment" for his side. "We're very proud, we've had three tough games but we responded well and finished top of the group," he told CNN. "It was a special moment when we pulled into the stadium tonight because the street was lined with U.S. supporters, waving the flag and chanting USA, I know it meant a lot to the players to feel that before the game so I'm glad we could deliver for the fans at the end." Defender Oguchi Onyewu said that he was overjoyed with his team's performance even though he had been dropped for the game. "It was a great game. That's why football can attract so many supporters and provide so much emotion," he said. "Even though I didn't play, I felt like I was on the field with all of my teammates. I'm just so thrilled that we got through the group stages without a defeat. "It just shows our mentality and team spirit. We're one unit."